Edward Sternaman (February 9, 1895 – February 1, 1973), better known as Dutch, was an American player, coach, and owner in professional football for the NFL's Chicago Bears. Sternaman and George Halas took over management of the Decatur Staleys (as the Bears were then known) in 1920 when both were working for the A. E. Staley Co., a corn products firm in Decatur, Illinois. Sternaman and Halas both starred in football at the University of Illinois under the coaching of Bob Zuppke. When A.E. Staley encouraged Halas to take the team north to Chicago where it might survive, Sternaman became an eager part owner of the club. 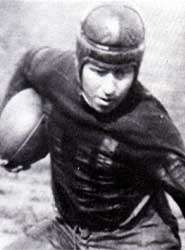 Sternaman played 10 seasons with the Bears after joining the team with George Halas in 1920. Along with Halas, Sternaman was co-coach of the team, quarterbacked for several seasons by Joey Sternaman, Dutch's younger brother. The three men were teammates at the University of Illinois in 1918. During the Great Depression Sternaman lost money in bad investments, and arranged for Halas to buy out his share of the team. The agreement had a deadline for Halas to make final payment or lose everything he had invested to Sternaman. According to Halas, he made the final payment with just minutes to spare. In the 1930s he coached at North Park University in Chicago. "Edward "Dutch" Sternaman, Owner 1920-1933". BearsHistory.com. Retrieved April 15, 2013.